The first months after the earthquake our support was marked by proving disaster relief and securing the safety and health of the citizens of Katunge village and beyond. From September 2016 onwards we shifted our focus from disaster relief to reconstruction. We extensively fundraised for rebuilding of schools and the community in general. We also found solutions to the housing crisis. We have become increasingly aware of the inability of the international organisations and the government to provide meaningful solutions and aid toward housing. 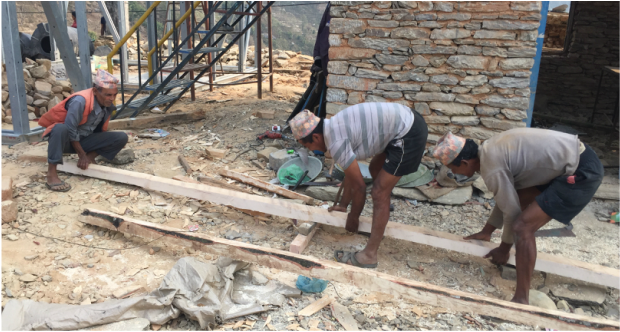 This ongoing phase focuses on the reconstruction of over 100 seismic resistant houses. Katunge village and hundreds of other obliterated towns and villages will achieve a better and sustainable future out of poverty only with continued efforts of grassroot organizations like Future Village. We like to think that our endeavours under The Chance Initiative make important lessons in disaster relief, redevelopment and collaboration. We hope that our journey can be a prototype, and an encouragement for others working in this field. Build the Home, Build the Future is the second phase of The Chance Initiative. We are actively seeking funds to make this phase a success.